Every Tuesday Diane at Bibliophile by the Sea hosts First Chapter ˆ¼ First Paragraph Tuesday Intros, where you can share the first paragraph, or a few, of a book you are reading or thinking about reading soon. I read Old Filth by Jane Gardam in 2008 and loved it, without realising at that time that there were more books about Old Filth QC (Failed in London, Try Hong Kong). So I was delighted to find there are two more. 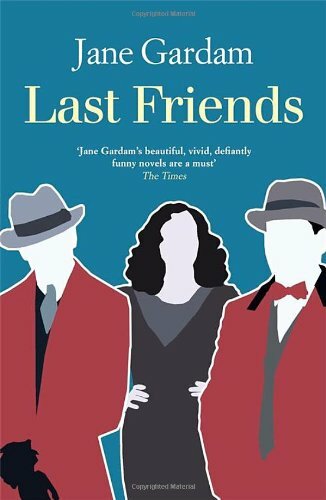 I’ve recently read the second book, The Man in the Wooden Hat, and I’m currently reading the third, Last Friends – nearly finished it actually. The Titans were gone. They had clashed their last. Sir Edward Feathers, affectionately known as Filth (Failed in London, Try Hong Kong), and Sir Terence Veneering, the two greatest exponents of English and International Law in the engineering and construction industry and the current experts upon the Ethics of Pollution, were dead. Their well-worn armour had fallen from them with hardly a clatter and the quiet Dorset village to which they had retired within a very few years of each other (accidentally, for they had hated one another for over fifty years) mourned their passing and wondered who would be distinguished enough to buy their houses. My reviews of Last Friends and The Man in the Wooden Hat will follow shortly. Ooh this sounds like a great start to a novel. Considering it’s a third in a series, I imagine you already know these two characters? I like the writing style, it’s very eloquent while not being overly complicated, if that makes sense! Thanks for sharing 🙂 I hope you have a great weekend! HA. The Filth thing made me laugh. Otherwise I wasn’t wholly convinced by the style of this opener, though that it made me laugh makes me think I would certainly consider reading a few more pages. I liked it and actually own this book and 5 others by this author –all unread. I call them part of my retirement collection. (This is my last week of work). I like the opening. This is a new to me series … will have to check it out. Oh, this sounds great, Margaret! I love that acronym. Glad you’re enjoying the book. Old Filth is on my nightstand now. This sounds like a good series! I like to read about villages like this one, Dorset. They seem very quiet and boring, but there is a lot going on. Glad you can read more of this series. Haha! I love the meaning behind Filth. Great opening. I think I would have to read the first two before beginning this one. I’m funny like that! 🙂 I would probably not have picked this series from a list or shelf, so thanks for the introduction. I’m glad to learn about this author. This looks like a great book! I like the opening. This sounds interesting. I like the tone of the opening you shared. I’ll have to go and look for the first book. Kind of a quirky voice. I’d need the blurb before I decide on this. This is a new to me author. I like the first paragraph.